This is truly incredible. Prosthetic limbs are now being given to even animals! 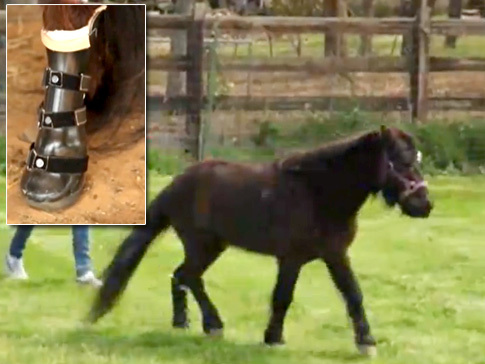 Scientists and Veterinarian doctors have used artificial prosthetic leg on a horse! This is not the first time this has happened. Doctors sometime back gave a car a prosthetic leg. AP did a story on the horse named Midnite, a miniature horse that was born missing his hoof and part of his bone. Due to lack of medical attention and care from his owners, the horse was seized by the authorities and brought to Ranch Hand Rescue near Forth Worth, Texas.